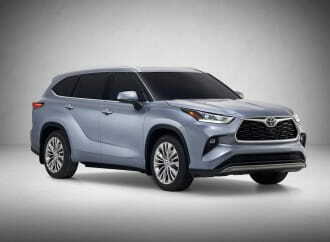 Every now and then, an automaker breaks the mold with a vehicle that seemingly has no point to it, other than entertainment value. 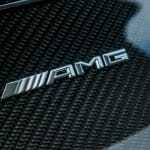 The power-hungry folks at Mercedes-AMG are notoriously famous for this, having produced models in the past that are phenomenally powerful and with soundtracks second to none. In the midst of a time when crossovers are taking over the world, they saw an opportunity to stuff a hand-built and boosted V8 into their second-smallest crossover. 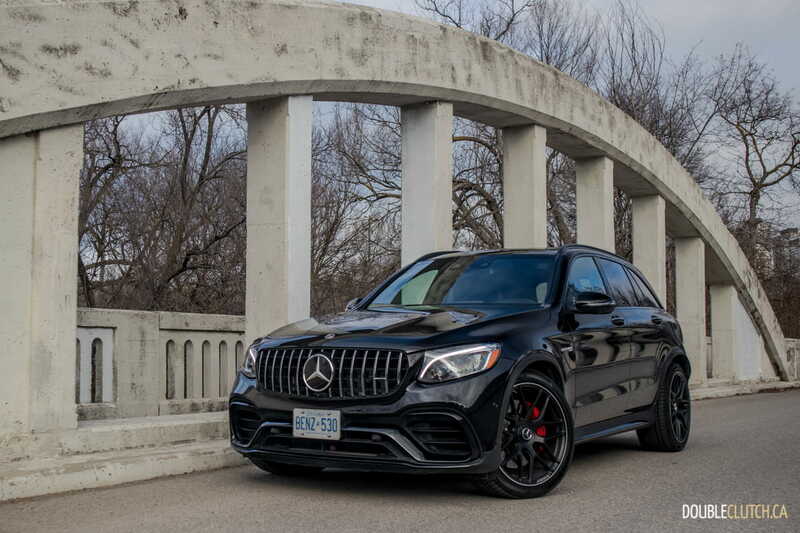 This 2019 Mercedes-AMG GLC 63 S 4MATIC+ is certainly manic, but we wanted to see just how it fares in the daily grind. 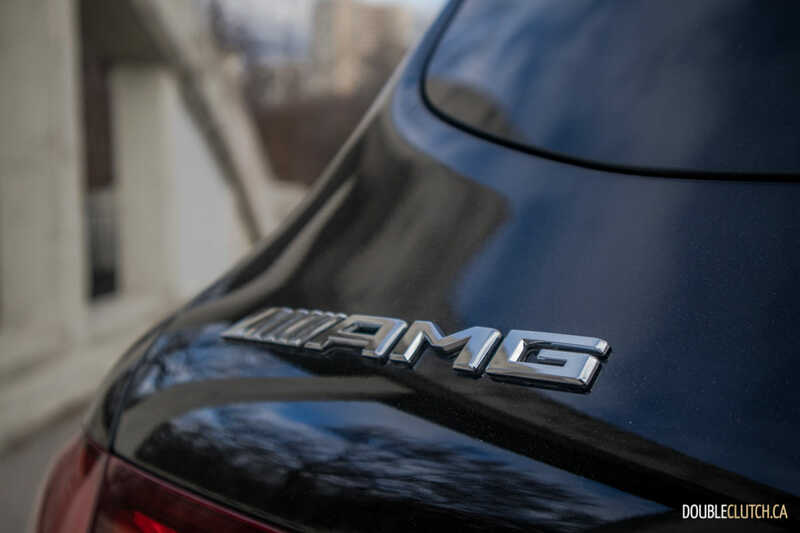 The GLC is available in two body styles; SUV and Coupé. 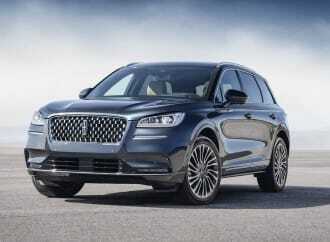 In my eyes and even putting the added practicality of the SUV aside, it’s also the better-looking example. 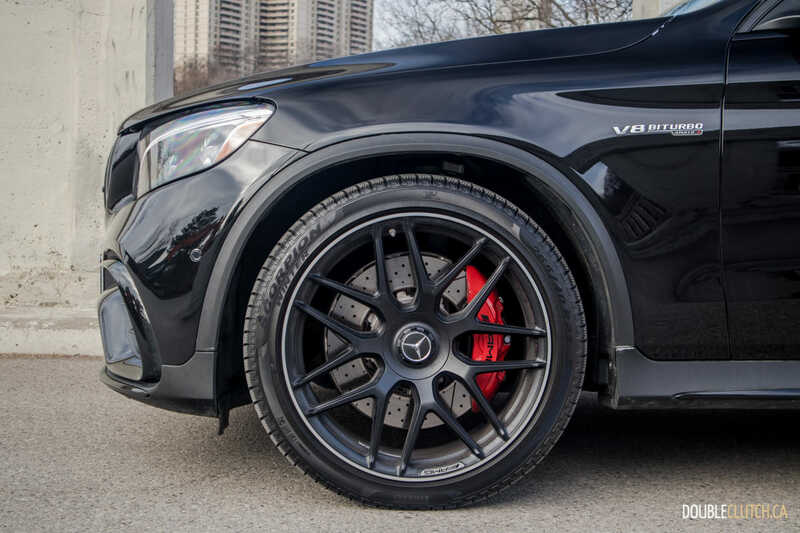 Painted here in Obsidian Black Metallic and with cross-spoke forged matte black wheels, the GLC 63 S has an awesome stance, with minimal wheel gap when the air suspension is in its standard setting. 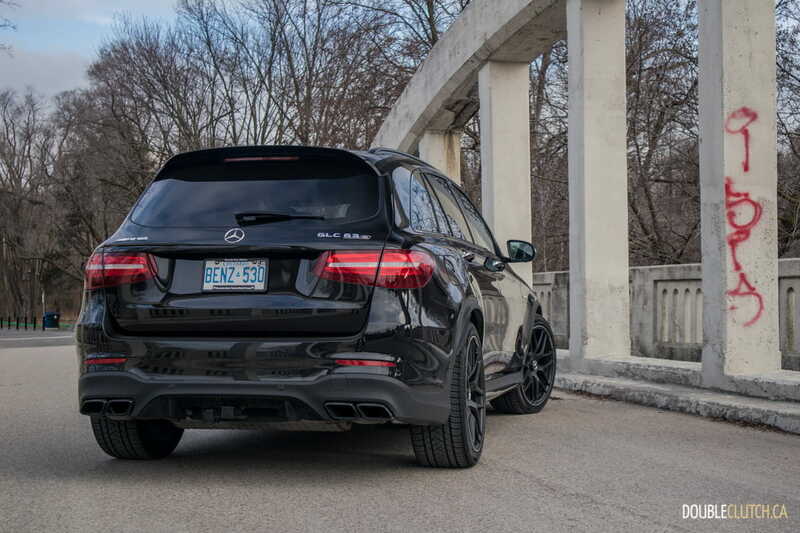 The quad exhaust tips in the rear and blacked out bits throughout the body contrast nicely with the LED lighting to make for one of the most aesthetically pleasing crossovers available today. 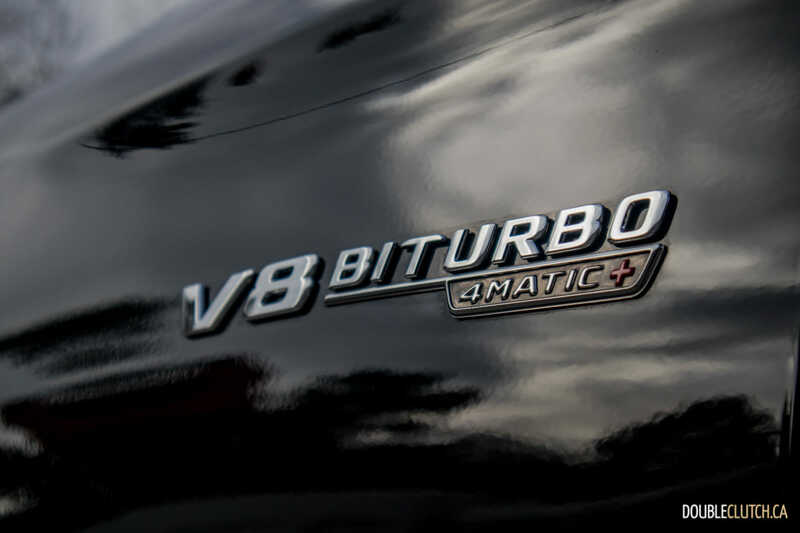 The hand-built AMG engine in this beast is a 4.0L twin-turbocharged V8 that’s also seen in models such as the E 63 (reviewed here) among others. 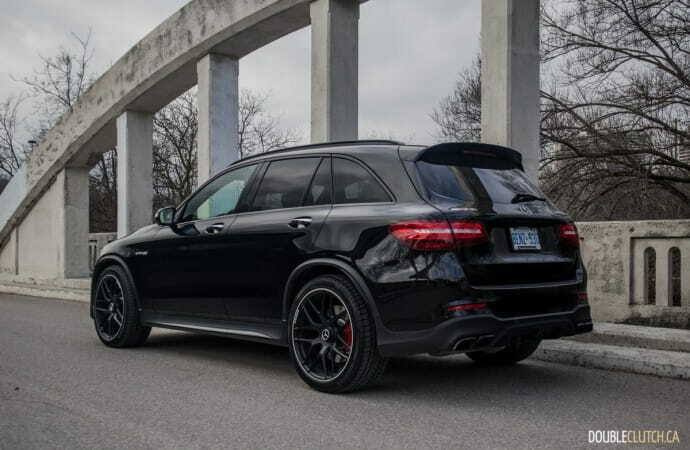 Output in the GLC 63 S 4MATIC+ is 503 horsepower at a screaming 5,500-6,250RPM and 516 lb-ft. of torque from 1,750-4,500RPM. 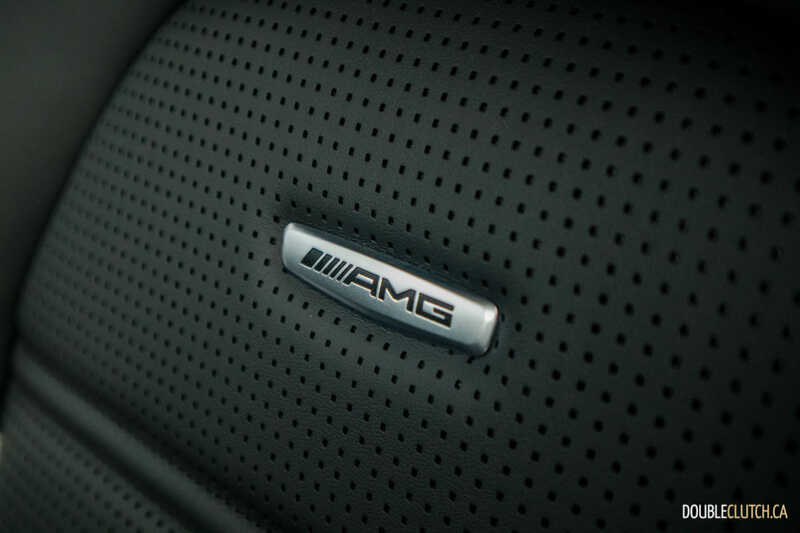 Despite being a boosted mill, power is immediate and is complemented by a growling and throaty exhaust rumble that’s now a highlight of the 63-series of AMG cars. 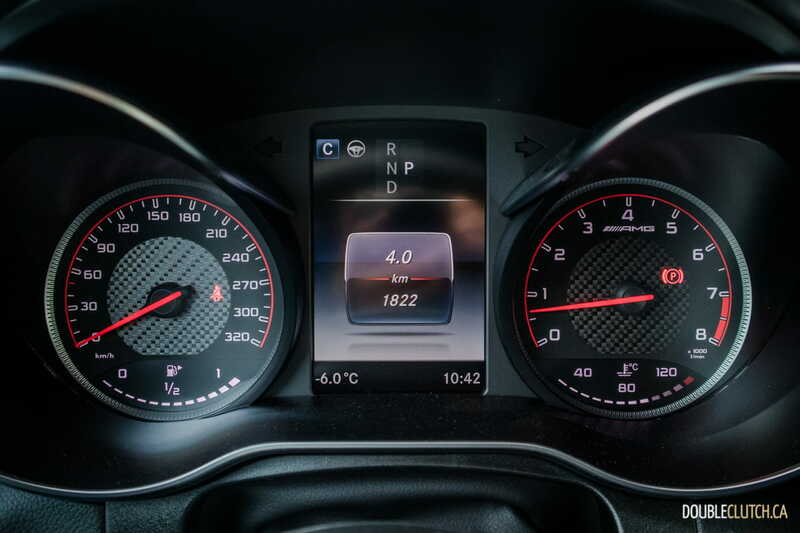 The 0-100km/h run takes just 3.8 seconds, a positively fast number for any vehicle. 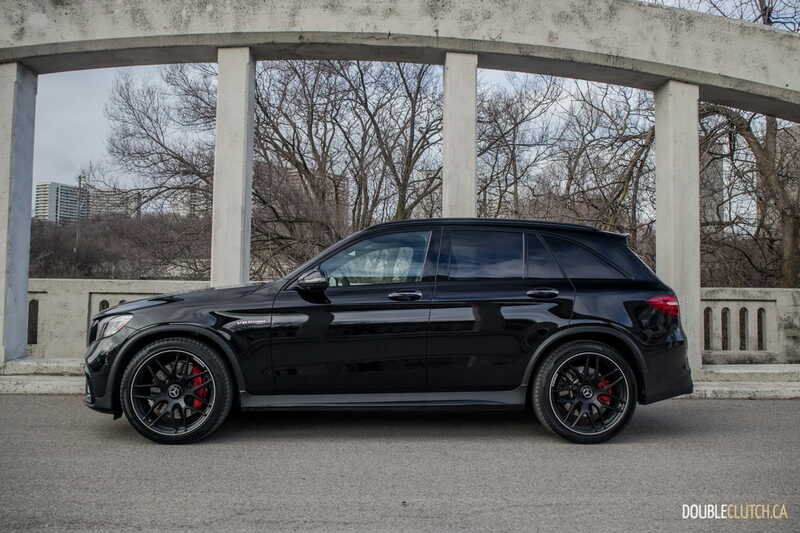 This number also makes the GLC 63 S one of the quickest compact SUVs in the world. 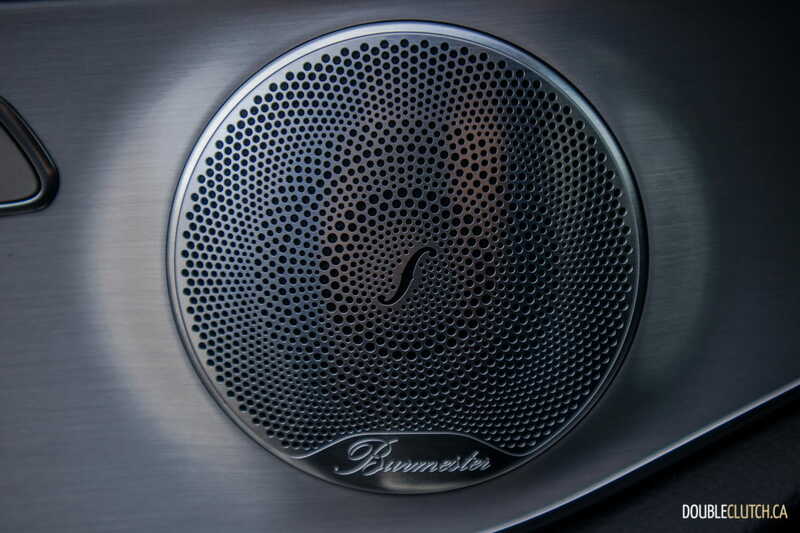 A nine-speed automatic is the only available transmission, and manages to provide adequate response on demand. 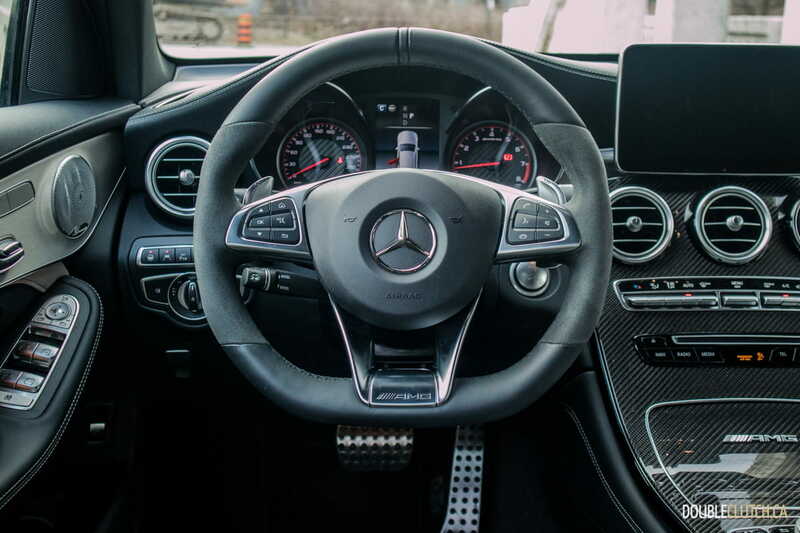 Manual shifting can be done using paddle shifters mounted behind the Alcantara-wrapped AMG steering wheel, but we found the GLC’s behaviour best when left to its own accord. 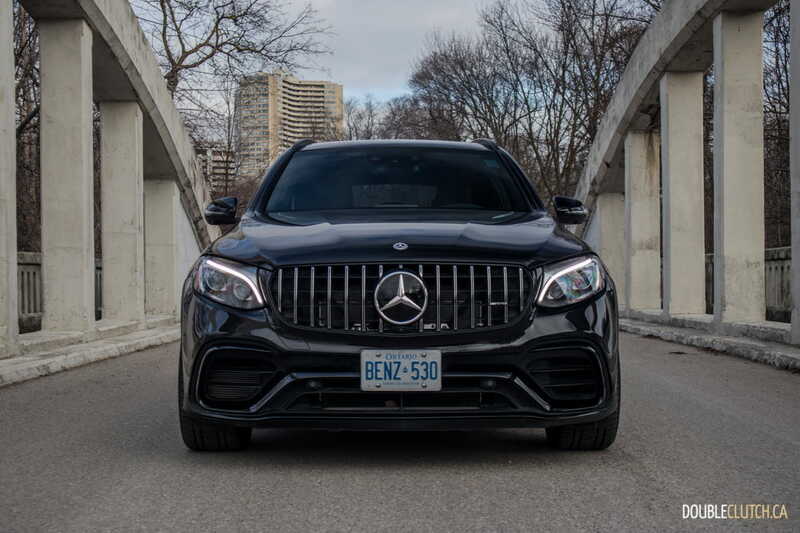 In stop-and-go city driving, there were some jerky shifts when the GLC was left in “Sport” or “Sport+”, so those opting to commute in this aggressive machine will want to stick to “Comfort” for the daily commute. 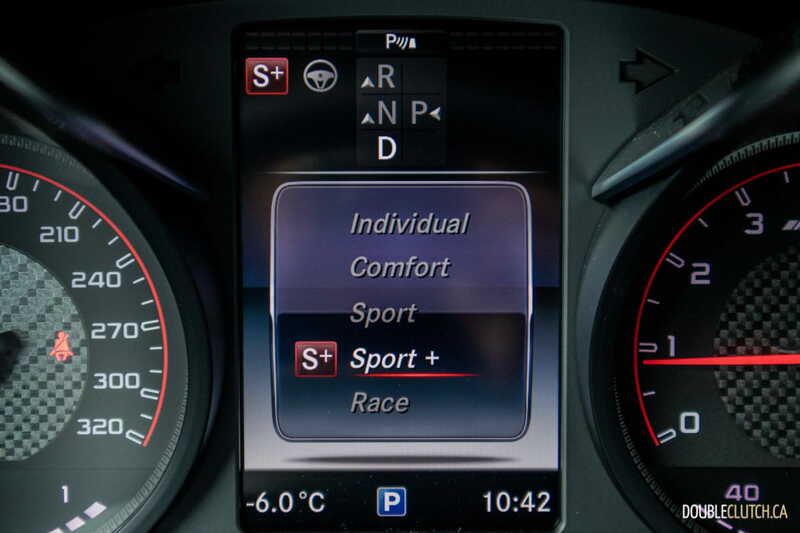 The drive mode selector can jump between a variety of settings between Comfort and the aggressive “Race” mode, which alters the vehicle’s personality quite a bit. 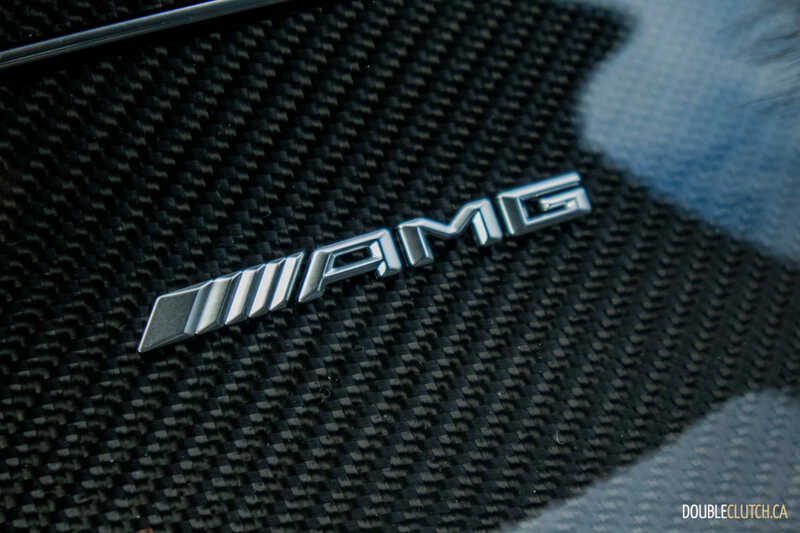 The suspension setup is Mercedes’ Air Body Control, which adjusts damping based on drive situation, selected mode, and the height can also be set using a button. 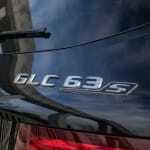 There’s no denying it though; the GLC 63 S is firm. 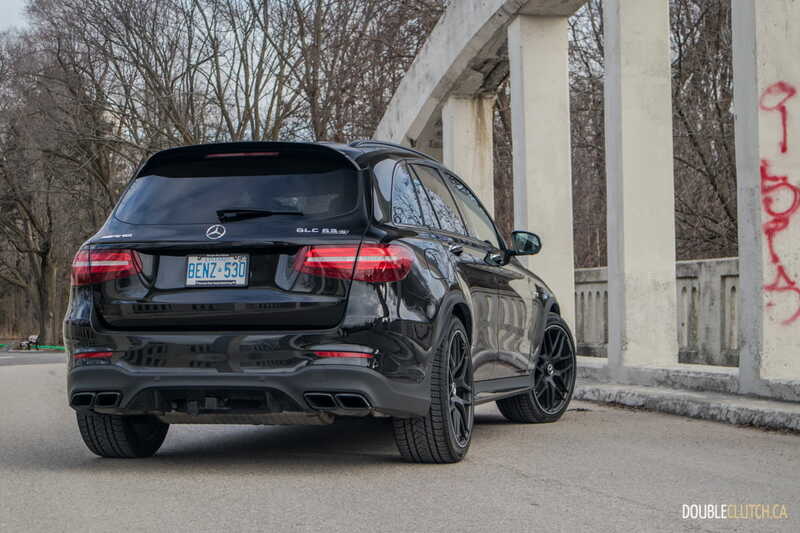 It’s a raw performance SUV, and not a slightly sportier version of the traditional GLC (reviewed here). 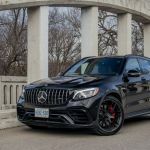 This is where it differentiates itself from the likes of its GLC 43 sibling, as well as the Audi SQ5 (reviewed here) or BMW X3 M40i. 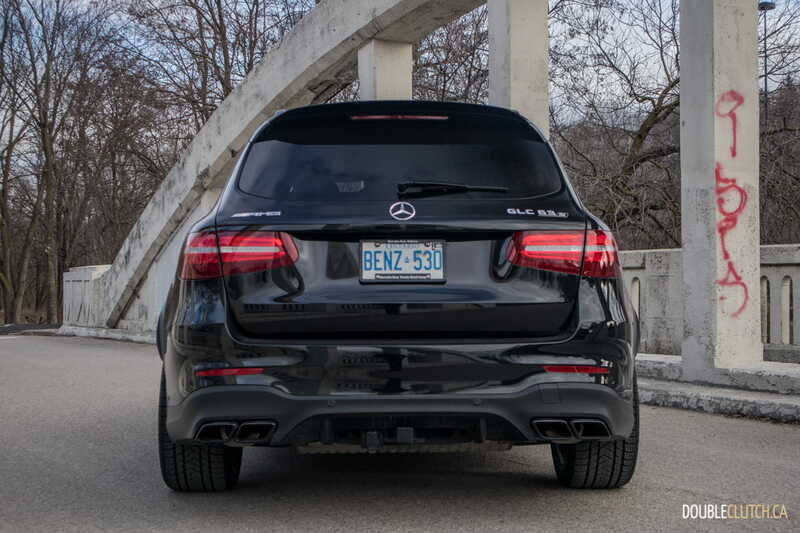 Weight distribution is, as expected, about 55/45% front/rear, which means the GLC 63 is a little bit front heavy. 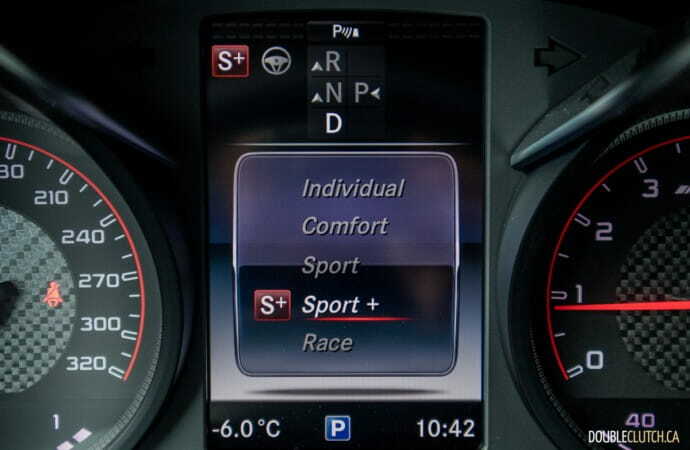 Even still, it feels well balanced and well sorted regardless of the driving environment. 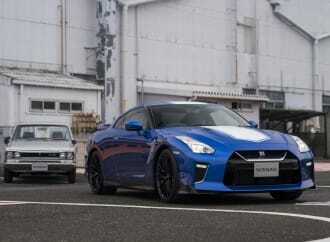 Steering response is quite good, with sharp reflexes at highway speeds and a noteworthy heft to the wheel. A tight 12.1m turning circle helps navigate narrow parking lots, too. 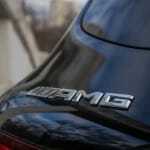 The 4MATIC+ all-wheel-drive system can send 70% of power to the rear axle. If grip gets questionable, the system will step in and send up to 40% to the front. 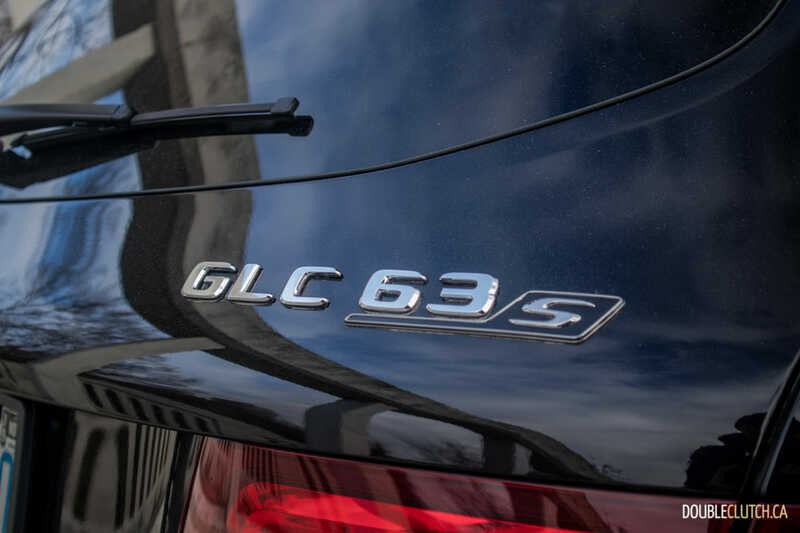 A fuel economy trick the GLC 63 S can pull is physically decoupling the transmission when coasting at highway speeds, helping significantly with fuel economy. Even still, we observed 11.4L/100km in strictly highway driving, and our test week finished off at 15.3L/100km in a combined setting. 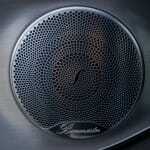 Factors affecting this are the large 21” winter tires and extreme cold weather. 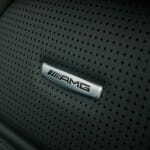 The AMG will only accept 91-octane fuel, and recommends 93-octane for ideal performance and efficiency. 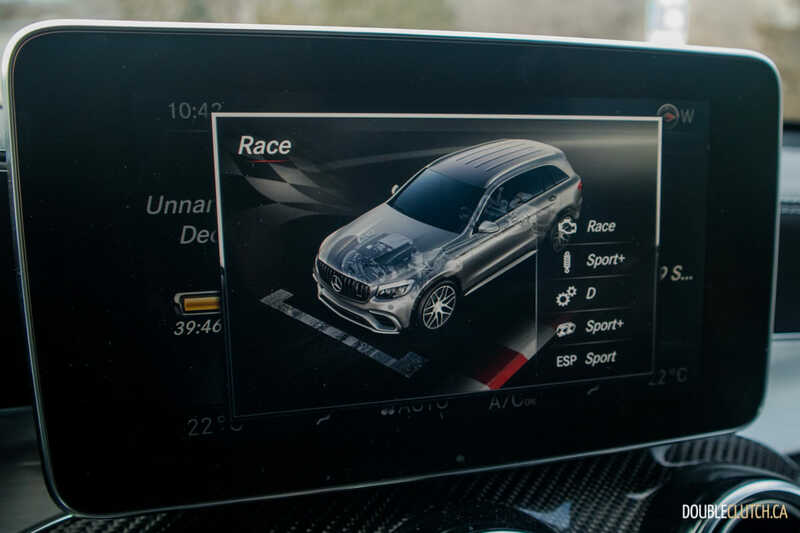 The interior of the GLC 63 S is fundamentally the same as the standard GLC models, albeit with some special bits and bobs to identify as the top dog AMG. 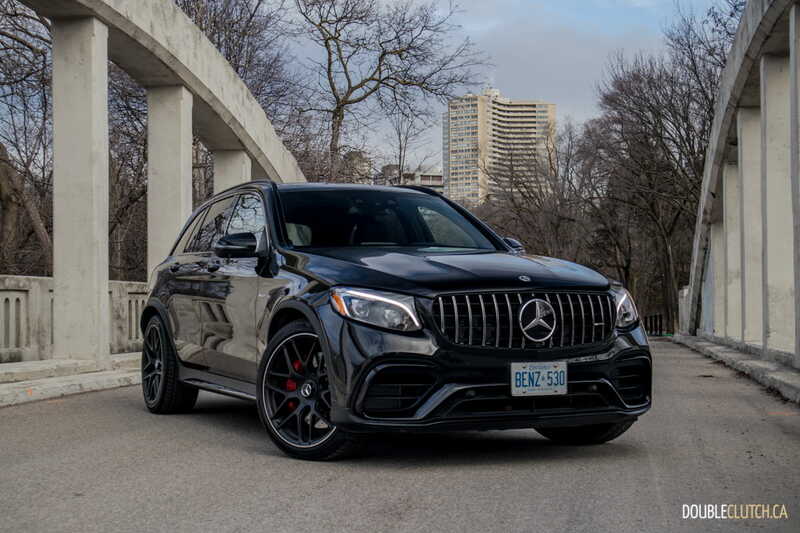 Our test vehicle was equipped with carbon fiber trim replacing the fingerprint-prone piano black in the last GLC 300 we tested, and the AMG seats are extremely comfortable and supportive. 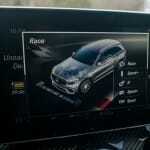 Connectivity is a challenge here, as the GLC still gets the previous generation of Mercedes-Benz’s COMAND system. 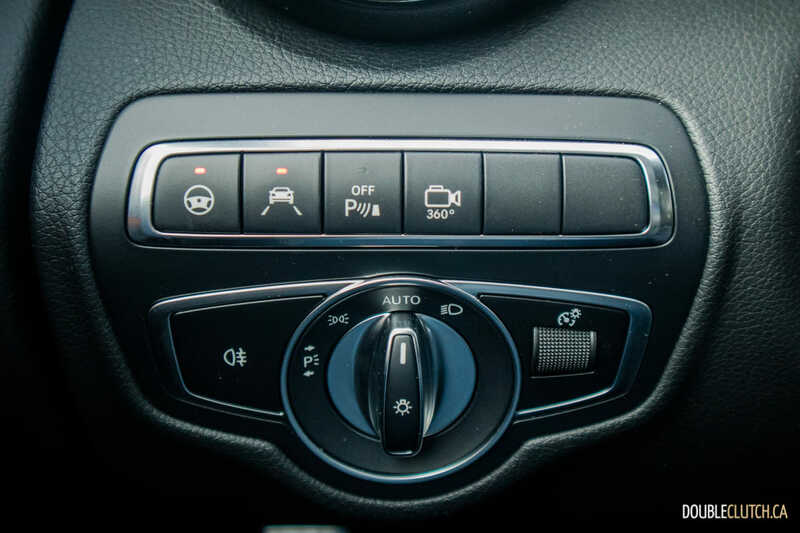 This means connectivity like Apple CarPlay is still missing, though we expect this to be rectified in a forthcoming update. The GLC 63 S starts at $90,500 in Canada, which is surprisingly reasonable for the amount of power that you get. 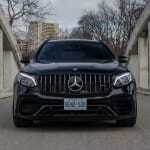 Our tester was equipped with the Premium Package ($5,800), LED lighting ($900), AMG Driver’s Package ($3,300), AMG Night Package ($1,000), Intelligent Drive Package ($2,700), Premium Rear Seating Package ($1,500), and a trailer hitch ($750), bringing the total to $109,590. 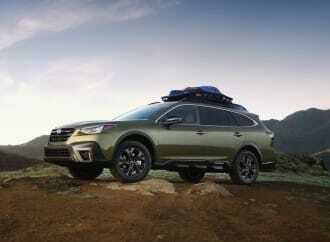 It’s worth noting that this is completely loaded with everything available – my ideal configuration for this model including the bare necessities and some premium upgrades comes in below the $100,000 mark. 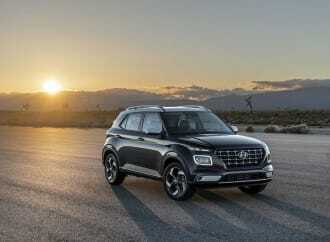 While BMW, Audi, and even Volvo offer performance versions of their crossovers, they are all either four or six-cylinder variants with forced inductions. 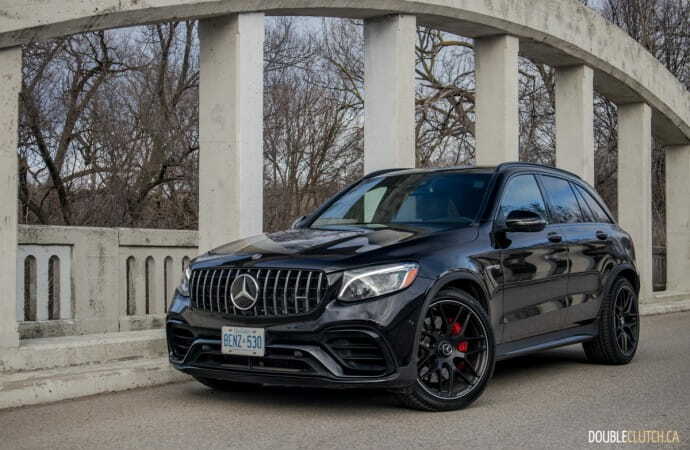 The only volume competitor that gets even close to the GLC 63’s sheer amount of power is the 440-horsepower Porsche Macan Turbo Performance Pack. 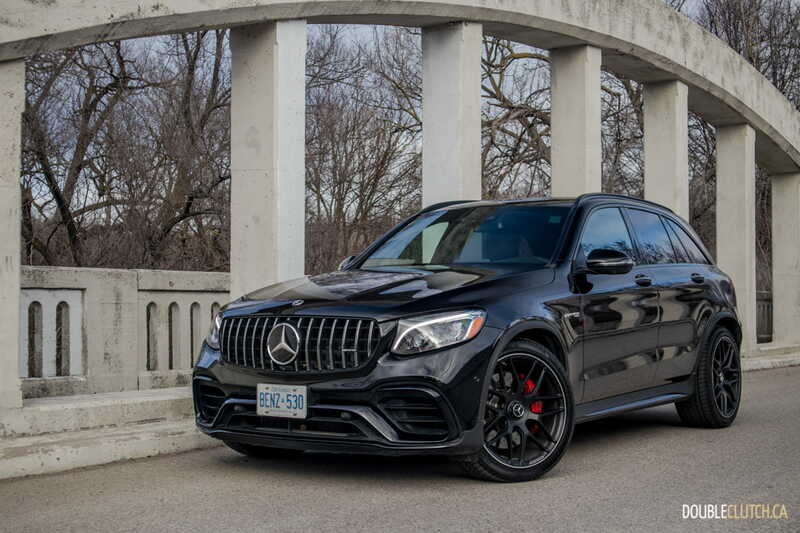 The Macan still takes over five seconds to hit 100km/h, and while it’s definitely fast, it’s nowhere near as blisteringly quick or focused as the GLC 63. On the niche side though, the Alfa Romeo Stelvio Quadrifoglio is right up there, with a similar power rating and has been tested to be marginally quicker. 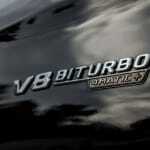 It comes with Italian quirks, however, and reliability results may vary. 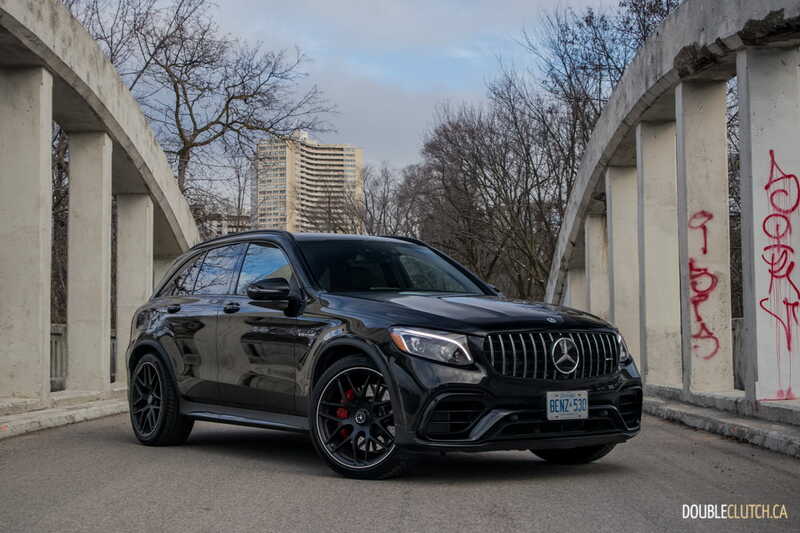 With the addition of the 2019 Mercedes-AMG GLC 63 S 4MATIC+ to the lineup, there really is a GLC for everybody. Starting at just $47,300 for an entry-level GLC 300, the line features both body styles, a “baby AMG” version in the GLC 43, and even a plug-in hybrid GLC 350e (reviewed here). 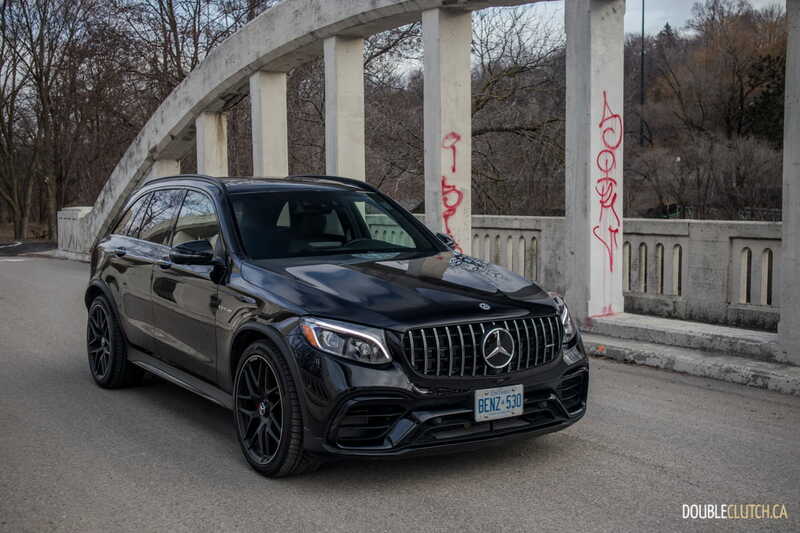 This GLC 63 S won’t be nearly as much of a volume seller like its more affordable siblings, but it is a niche product that clearly demonstrates that Mercedes-Benz is happy to show off their wild side.